Dissecting Apathy: Why Should Yale-NUS Care about the Student Government? Unlike local government and school council election speeches, the number of students who were present in the Tan Chin Tuan Lecture Theatre on Monday, Aug. 28 to witness the debate for the Student Government Elections was equal to the number of candidates running for the seats — thirteen. The emptiness of the lecture theater is just one of the many manifestations of apathy towards the Student Government in Yale-NUS — ironic for a school that prides itself in its involvement in external politics. Outside of class, students have initiated and led numerous campaigns in school, such as fossil fuel divestment, petitioning against the Latin Honors System and against the three-year bond of the Tuition Grant Scheme for international students. Yet, this enthusiasm towards politics vanishes altogether when it comes to the politics of the Student Government. Apart from the low turnout during the debate, the eventual voter turnout was also only 55% of the school’s population, barely over the 50% quorum. 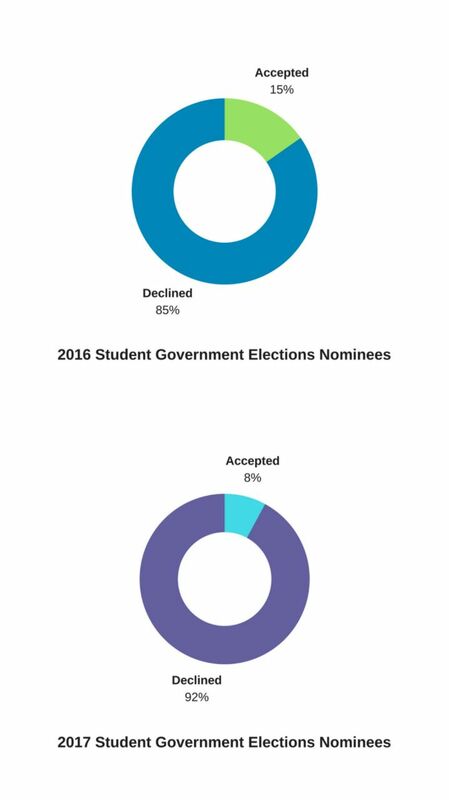 This disinterest towards the Student Government surfaces was reflected not just in the voting process, but also in the nomination process: this year, only 8% of nominees accepted candidacy for the Student Government, as opposed to the 18% of nominees from last year’s elections. Outgoing Director of Student Organizations, Anandita Sabherwal ‘19, expressed her disappointment towards the initially-vacant seat for her position, adding that it is an important position that has a role in determining budgets of student organizations, and thus can impact the type and scale of events these student organizations can hold. Additionally, in forming the Student Government Judiciary, outgoing President Saza Faradilla ’18 had to personally appeal to individual students to apply for the vacant positions. Despite the Student Government’s increased visibility in the past semester through projects such as the summer storage system, Sabherwal said that students maintained low interest levels in engaging with the Student Government. The percentage of student nominees who decided to run for their positions dropped significantly since last year’s elections. One of the reasons why there were fewer nominees accepting their roles could be due to the changes in the election system. However, the current system did not work according to plan. Although the number of candidates running was still greater than that of the previous elections, the more administrative or executive roles, such as Director of Finance and the Director of External Communications, were either left uncontested or unfilled; while the more legislative positions, such as class representatives, were comparatively more contested, with 3 candidates running for Class of 2021 Representative and 2 candidates for the Class of 2019 Representative. In addition to the change in the election system, the apparent influence and power of other student organizations downplay the students’ perceptions of the importance of the former as a venue for them to express their opinions and push for changes in school policies. With the presence of organizations such as The G Spot (The Yale-NUS Gender and Sexuality Alliance) and Aloe: A Mental Health Group, students are granted access to other spaces that bring together people with common concerns, allowing them to develop their ideas before proposing them to the Student Government. Nyang Bing Pei ’21 said, “[the] current clubs in school are already working very well” and “problems that are more rampant in school can be solved by student organizations”, hence eliminating the need for students to go directly to the Student Government to look for solutions to their concerns with school policies. Additionally, the culture of busyness that prevails throughout the college community also desensitizes students to the politics of the student government. As President and Professor of Humanities (History) Tan Tai Yong said in an interview, “there is a competition for time when many of [the students’] interests lie somewhere else”. For one, few students engage with the Student Government not only during the term of the government, but even before, during campaigning season. This apathy is reflected not just through the election debates, but also through the low turnout rates for casual hangout sessions that allow for students to learn more about the candidates in informal settings. Candidate for the Class of 2021 Representative, Lim Wei Da ’21, said that the turnout for the hangout session he had organised with other candidates was poor due to the hectic schedules of students. The disinterest towards the Student Government may also be rationalized by the numerous walkover positions this year. A student, who requested anonymity, spoke of her disinterest in attending the elections debate: “why should we go when so many of the positions are walkovers?” This cause of disinterest is also reflected in the elections held by the Yale University College Council earlier this year, in which only 22.3% of undergraduates voted in the presidential election, one of the least contested positions for that cycle. Yale Daily News, Yale University’s student newspaper, reported that the outgoing President and Vice-President in the aforementioned election “attributed the low voter turnout to the high number of uncontested races”. Sabherwal agreed with this view, saying that it is understandable for students to be disinterested in election speeches given that there are no alternatives in majority of the seats. However, the Student Government exists not only to bring about great change, but also to regulate day to day living; these efforts go largely unnoticed. This includes seemingly minor projects implemented by the Student Government, such as the extension of gym opening hours, and more eco-friendly policies such as the implementation of Meatless Mondays, both of which have subtle but important impacts on daily life at Yale-NUS. On the role of the Student Government in the college community, Sabherwal ‘19 said that although students might be accustomed to RC4 days of having “the Dean of Students’ number on their speed dial”, they have to recognize that as the school grows in size, it is no longer possible for the administration to attend to each individual’s concern. This is where the Student Government comes in to collate feedback and relay that to the administration to improve upon school policies. Additionally, while the responsibilities of the Student Government might appear bureaucratic and inconsequential to the student body, it is the small policy changes that trigger greater effects on the school community. For example, Sabherwal said that something as bureaucratic as allocating a Student Organization’s budgets is done with careful consideration of the scale of an Organization’s future events, with such decisions having a direct impact on the overall operation of an organization. “Student organizations have independence and agency as they should have, but […] there needs to be somebody maintaining [this] well-oiled machine,” said Sabherwal. Even though there were numerous unopposed positions in the Student Government Elections, it is imperative that students still involve themselves in the electoral process to ensure that the elected members of the government are representative of their voices. President Tan said, “Participation is important, and the way the college is something that depends on that”. This is particularly so since the Student Government can influence student life, and even those students who do not support the candidates for any of the positions still have the option of submitting a vote for “None of the above”. Overall, this points towards forging a stronger college culture, said President Tan, in which the college can only function with constant engagement between the student body, the Student Government and the college administration.